Hold a concert, sale, tea dance, quiz night … (the possibilities are endless) or take part in a sponsored challenge event, with the proceeds going to a local charity or group supporting refugees, e.g. Asylum Welcome, Refugee Resource, or Sanctuary Hosting. Ask for the charity’s support in organising this. Asylum seekers are not allowed to work and often have very limited funds. Place a box in the church for collecting food and toiletries for asylum seekers in Oxford. Asylum Welcome can provide labels for collection boxes and a list of most needed items. Encourage the whole congregation to donate items and when full deliver it to Asylum Welcome’s office at 7 Newtec Place, Magdalen Road, OX4 1RE, open weekdays from 9.30am to 4.00pm. Alternatively order online for direct delivery: instructions are at http://www.asylum-welcome.org/donate/food-donations. Spend a few days, or more, as a kitchen volunteer in Calais with a charity providing food for displaced people living rough in difficult conditions in northern France. Social activities are great for individuals’ wellbeing, improving language skills, and integration and also help promote community cohesion. Help with existing activities or start something new. As a volunteer with Refugee Resource, meet with a refugee for about 2 hours a week or fortnight in the daytime. Listen, help and support people as they seek to gain access to services, social activities, education and work. Training is provided. As a volunteer with the Refugee Support Network, meet for an hour a week with a young unaccompanied refugee (aged 15 to 21) to help them progress in education, e.g. by working on an aspect of their homework or classwork which they find challenging. If you speak Arabic, volunteer to assist support workers with recently resettled Syrian families. Or if you have an ESOL qualification, volunteer to teach them English. If you are a university student in Oxford you can register as a volunteer tutor and be linked with a refugee family. Many refugees in the UK experience destitution, for example when their asylum claim is refused or when they are granted refugee status but are then left without any benefits or housing. Award-winning local charity Sanctuary Hosting can help you host a homeless asylum seeker, refugee or vulnerable migrant rent free in your spare room for an agreed period of time. Share not only your home but also social and cultural experiences, supported throughout by a volunteer support worker. Form a group offering full support to enable a Syrian refugee family to be resettled to Oxford under the government’s Syrian Vulnerable Persons Resettlement scheme. Groups need to work under the auspices of a charity and are responsible for organising accommodation, welcome, orientation, English language instruction, and help accessing services and employment. This may sound daunting, but there is much assistance and advice available from Sponsor Refugees and Blackfriars Oxford, a local church which has already done this, as well as from Oxford City Council and local refugee support charities. Community Sponsorship is a really tangible and personal way of responding to the needs of refugees and can be an extremely positive experience for the group too. Refugee week, in June each year, is a UK-wide programme of arts, cultural and educational events and activities that celebrates the contribution of refugees to the UK and promotes better understanding of why people seek sanctuary. Get ideas and tips on organising your event, as well as events listings, from the Refugee Week website. Refugees suffer many injustices and hardships, overseas and in the UK, and there is much which needs improving. You can help change policy and practice affecting refugees. Keep informed of the issues and latest petitions and campaigns by signing up for CCOW’s quarterly email Refugee Support Newsletter and/or emails or mailings, from refugee charities. This resource was prepared by Christian Concern for One World (CCOW) in October 2018. For over two decades, CCOW has been working with Christians who seek to discern what ‘doing justice,’ ‘loving kindness,’ and ‘walking humbly with God’ mean for us in our globalised world. 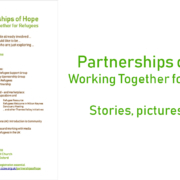 For further information or to request that information be added to future editions of this resource, please contact Joanna Schüder, CCOW’s Churches Refugee Networking Officer on joanna@ccow.org.uk or 07774474601.